Ive searched this and am now confused. In the FSM wiring diagram the locks look like positive but I searched and found some answers for 90's hondas saying that they are negative locks. Which are they for an alarm installation? not sure what you mean by the locks being positive or negative. are you talking about the polarity of a wire? Negative locks use a ground switch to complete the circuit and activate the locks. The way the alarm system works is that it will complete the ground via the control module to lock or unlock the car. Positive uses a pulse of electricity I believe with the ground already in connected. Id have to use a relay hook up if they're positive. From what I gathered, most asian cars are negative locks but the wiring diagram seems to suggest otherwise. Last edited by RobinsonRicer; 06-17-2013 at 10:08 PM. 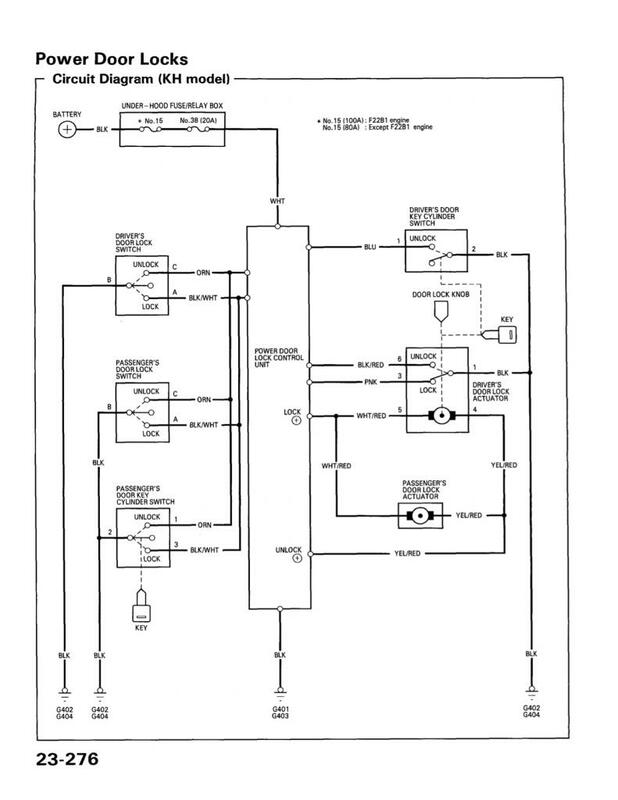 you need to reference the wiring diagram for your make/model and verify. I have the service manual for the car posted in a sticky in this section. all negative trigger means is that the door pins connect to ground. if the alarm has both, use the negative. the alarm manual will tell you if you need a relay or not. sometimes the relay is internal. note that when closing the circuit, all of the current from all of the lights flows through that point. Last edited by keep_hope_alive; 06-17-2013 at 11:52 PM. The manual is extremely vague and does not explain installation. It only has diagrams of the different lock set ups. When looking at my cars diagram with a fresh pair of eyes I see that it is negative. I was thrown off by the lock/unlock labels connected to the accuators. Now I need to figure out how to wire it so that I can get all the locks to unlock when I push the button. Or does it do that automatically if I push the button twice? I know on the passenger side if I turn the key once quickly it will just unlock that door, a longer duration or two turns will unlock all the locks. Im not sure about the drivers side since the cylinder is jammed. I understand the general installation and know where to splice and cut most of the wires but the locks Im a little unsure of. Heres a link to the manual. Last edited by RobinsonRicer; 06-18-2013 at 06:06 AM. in the manual, under the door lock diagrams, the Negative Trigger diagram is what you use. Green Wire (-) Lock ties to the Blk/Wht Lock wire above. it pulls the Blk/Wht wire to ground (same as the actual switch) to send a lock signal. Blue Wire (-) Unlock ties to the Orn wire above. it pulls the Orn wire to ground to send an unlock signal. Yeah. I understand thanks. I think it may take a little trial and error but this shouldnt be too hard. Now what I dont know about is will I be able to just open the drivers door with one click and then all with a second click like it will do when turning the key? Is that programmed in the cars lock module to happen when the circuit is grounded or is that something in the lock itself that wouldnt be influenced by the intervention of the alarm control? you can get it to do driver's only on one pulse and all doors on a second pulse depending on how you intercept the door lock wiring. my description above was for all locks at once. for separate unlocks you need to tie into the driver's lock only for one input and for the passenger lock all for the other input. the alarm needs to have two unlock inputs for that purpose. for reference, i use Autopage alarms, very detailed wiring diagrams. Ok. Ill play around with it and look up that reference. Im having more issues though. I got the locks working well enough for now but not I have a few issues. I installed the alarm with everything connected correctly. First, the alarm will go off about 60 seconds after the ignition is engaged and will not turn off unless the power to the module is cut or the keys are taken out of the ignition and the override button is pressed. After this the alarm will not work unless I reset the module. The yellow wire is connected to the ignition and by default the doors will lock when the ignition is turned on so I know its connected correctly. There seems to be an issue somewhere in the actual module. The siren will turn on when connected unless the alarm itself is tripped and it will be very quiet. The wires are correct- red to module output, black to ground. The siren output reads 12.4 volts- same going in- but the amperage seems low because when I tested the alarm to the 12v module input, it turned on at normal volume. The rest are not connected yet. Im a bit confused by the Orange ground when armed. Do I ground that or only use that if I need a starter kill switch? Im trying to find a way to to get the door trigger to work. I tried connecting it to the courtesy light wire but that didnt seem to work. The alarm is triggered when the two door inputs touch. What could I use that would work for all the doors?